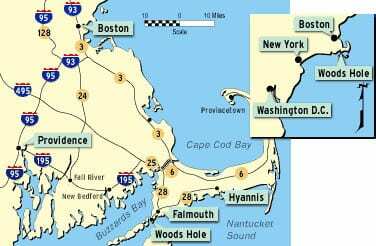 Take Route 3 south; follow signs for Cape Cod. Cross the Sagamore Bridge, take the first exit off Route 6, and follow signs for Falmouth and Route 28. Travel south along the Cape Cod Canal until you reach the rotary at the base of the Bourne Bridge. Three quarters of the way around the rotary, bear right and continue south on Route 28. At the second rotary on Route 28, travel halfway around, bearing right to continue south to the town of Falmouth. Bear right after the Gulf station onto Woods Hole Road. 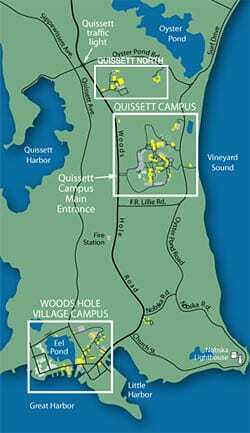 Travel two and one-half (2.5) miles to WHOI’s Quissett campus (on the left), or four (4) miles to WHOI’s facilities in the village of Woods Hole.